Work through our self-paced labs following step-by-step instructions on how to develop with the Moovweb SDK. Try a simple transformation using the Moovweb Blog. Build an entire mobile site from start to finish. Build a hybrid app using Moovweb and PhoneGap. Learn how to deploy to the Moovweb Cloud. Improve the performance of your Moovweb project. Learn everything you need to know about Moovweb by taking our online courses. Watch videos, write code, and receive detailed feedback from an expert Moovweb Developer. 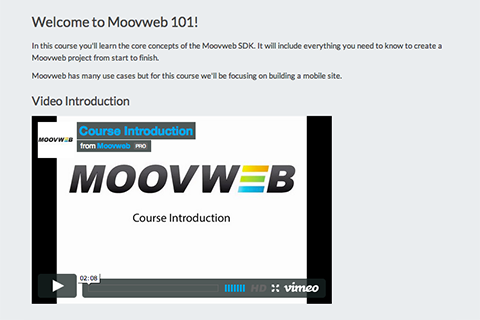 Start transforming your first website as you learn the core concepts of the Moovweb SDK. A developer’s guide to transforming websites with Moovweb. Sign up for live demos of the Moovweb SDK.